When logging into SIMS via the Hosted Application Service (SIMS Terminal Server) you are using a windows authenticated account which does not work for the legacy SIMS Options Module transfer process. 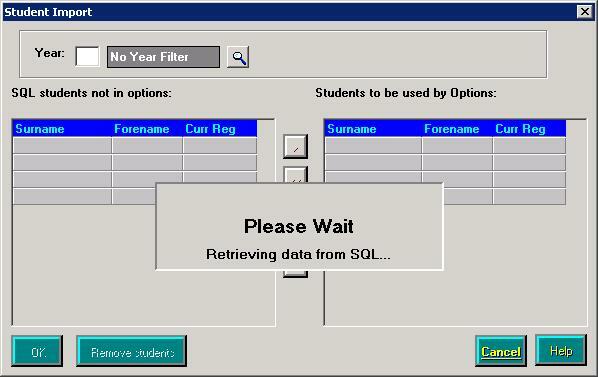 This problem will also be faced by schools hosting their own data choosing to use Windows Authentication for SIMS .net. 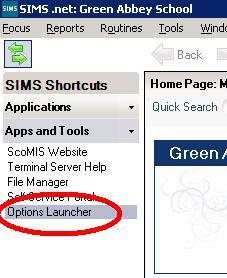 The users in school who need to use the SIMS Options Module need to be allocated the “Options Launcher” shortcut. Posted in Hosted Apps, Options, Services, SIMS.net, Timetabling and tagged Hosted Application Service, options, SIMS Options Module, SIMS Terminal Server, SQL User, Windows Authentication. How do I change the order of the years on the Model Screen? How do I make the registration periods appear on student timetables? How do I bulk print the teacher timetables? How do I set up Alternative Curriculum? How do I set up non timetabled classes? Unrecognised Teacher Codes when sending timetable. What is the purpose of the Combing Chart? When I try to send the Timetable from Nova T6 to Sims.net I get a critical error -"Cycles do not match". When I try to send the Timetable from T6 to Sims.net I get the error message: "Cannot insert value null into column non-class code description"